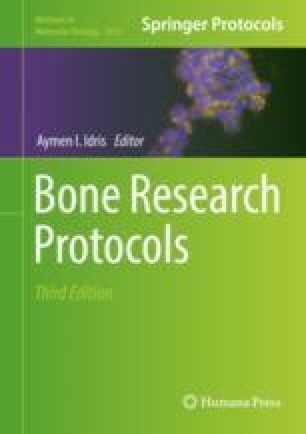 This chapter describes methods for preparing samples of bone and bone cells for scanning electron microscopy (SEM). Backscattered electron (BSE) imaging is by far the most useful in the bone field, followed by secondary electrons (SE) and the energy dispersive X-ray (EDX) analytical modes. Samples may have 3D detail in a 3D surface, or be topography-free, polished or micromilled, resin-embedded block surfaces, or resin casts of space compartments surrounded by bone matrix. Methods for cells include fixation, drying, looking at undersides of bone cells, and metallic conductive coating. Maceration with alkaline bacterial pronase, hypochlorite, hydrogen peroxide, and sodium or potassium hydroxide to remove cells and unmineralized matrix is described in detail. Attention is given especially to methods for 3D BSE SEM imaging of bone samples. Recommendations are made for the types of resin embedding for BSE SEM imaging. Correlated confocal and SEM imaging of PMMA embedded bone requires the use of glycerol to coverslip. Cathodoluminescence (CL) mode SEM imaging is an alternative for visualizing fluorescent mineralizing front labels such as calcein and tetracyclines. Making spatial casts from PMMA or other resin-embedded samples is an important use of this material. Correlation with other imaging means, including microradiography and microtomography is important. Shipping wet bone samples between labs is best done in glycerol. Control of the vacuum pressure in the SEM sample chamber (now generally available) can be used to eliminate “charging” problems which were common, for example, with large, complex, cancellous bone samples. I thank Maureen Arora for her patient help in carrying out procedures described in this chapter on many thousands of samples and many colleagues who have helped to check this revision. Philippe Clezardin provided the sample shown in Fig. 8.